Mail4Rosey: Happy Earth Day from Mail4Rosey and Education Insights! Happy Earth Day from Mail4Rosey and Education Insights! Happy Earth Day! We are celebrating by breaking out our brand new talking globe from Educational Insights. This little beauty is chock full of great information and is going to be a fun learning tool for a long time to come! My second oldest (grown) son is about to take a trip to Europe. We will be using this globe to follow along with his travels as he goes. He is going to quite a few cities and we are excited for him, to say the least. Now we'll be able to hear facts about where he is, through the globe and have a visual of how far from home he is at any given time. Right now the youngest boy has been sitting at the globe for over 45 minutes. He was taking the talking pen and going over the states that interested him, learning not only about capitals, but also about what kind of nature is in them, what cities are prominent in them, what the nicknames and popular items might be in them, etc. When he expanded to other parts of the globe, I was laughing at him when he kept telling me it was broken. "It keeps saying Egypt is in Africa!" He just couldn't believe that was true, lolol. I finally told him Egypt is in Africa and he laughed. It also tells you about continents, oceans, countries, measuring between cities (now that is a fun feature...it tells you kilometers or miles between any two cities, and how far it would take to travel between them by plane), and so much more. I think this is the perfect item to have any day, but most assuredly to help celebrate Earth Day. It's such a wonderful holiday to tout, and I love seeing how involved people all over the city have become (most especially the schools), with helping to celebrate this wonderful planet we call home. What better way to do it year round than with globe with so many thoughtful features?! 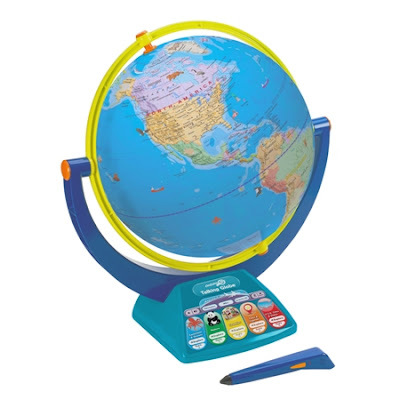 I highly recommend this talking globe, as I do all items thus far that I have purchased or received from Educational Insights. Visit their website to learn more. You can follow along on their social media channels as well: Facebook, Instagram, Pinterest, and/or Twitter. Oh my goodness, I love that talking globe. I've been looking for a globe for the kids. They're getting older and interested in places around the world. My grandson is infatuated with everything there is to see and do in Dubai. Now that is neat. Can teach kids and even ourselves. I love the idea! It will be neat to follow your son's travel via this talking globe. Happy Earth Day! I have always been enthralled by globes. They have so much to offer and teach us about our planet.! A globe is strange to see years ago so many people owned them. But today they go to the internet. But just looking at this I think it is a better learning tool. The Talking Globe would be a wonderful gift for any child. I love educational products like this. Educational and fun! I would have loved this when I was a kid. I hope your son has fun on his trip to Europe! I've always thought those little globes looked cool. Very interesting to see a newer globe, I don’t think I’ve seen one since I left high school! I love how this glove you describe not only discusses geography but also discusses the nature of the land as well. That was really a great blog. It really helps to create a newer point of view of the thing that we learned during our old school days. Thank you and will wait for more. That is really awesome! I have never heard of a talking globe! That's a great globe. We have more of an antique looking one. This is more educational. What a fun way to teach kids, this is great kids would really love this, and it looks very practical and usable too. I love that he spent 45 minutes with the globe asking about the world. Kids are so curious about the world and it's wonderful.